5975 Culver Dr. SE Salem, Oregon 97317 503-393-2758 Hours: Open daily from 8 A.M. until 8 P.M.
We are a small 2.5 acre blueberry farm in Salem, Oregon. Our primary business is U-pick, but we also offer ReadyPick options as well. During regular season, an attendant is available every day from 8 A.M. until 8 P.M. Please visit our Facebook page for season announcements, updates, and changes. Visitors are welcome at any time for U-pick! We have an honor pay system in place in the event a team member is not present to assist you. We prefer cash, but also accept checks and most debit/credit cards. 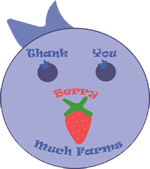 Please make checks payable to Thank You Berry Much Farms. U-Pick is a great, fun outdoor activity! Bring your family and friends to pick and enjoy some of our delicious fruit. There are plenty of berries for everyone! Have your own buckets and containers to use? Bring them in! Be sure to get them weighed when you arrive. We do have buckets available for use while picking and plastic grocery bags to take home. We do not have cardboard available for U-Pick berries. Are you unable to come pick, or want some berries for work or on the road? We can help! We have berries picked daily that are available for instant enjoyment. *Please call ahead for large orders! This allows us to ensure we will have enough to meet your needs. Thank you! From Cordon Road, go East on Macleay Road, then take the first right onto Culver drive. You'll see the big blueberry sign by the driveway on your left! Go East on Highway 22 and take exit 4 for Gaffin road. Follow the road, then take a left at the first 4-way stop onto Culver drive. You'll see the big blueberry sign by the driveway on your right! Thank You Berry Much Farms is owned and operated by the Wheeler family. In 2013 the family purchased a 10 acre property, with 2.5 acres of blueberries already in place since the 1970s. Until the family purchased the farm, the berries had been kept mostly as a commercial operation. The Wheeler family chose to dedicate the berries to a full-time u-pick operation. Before moving to the farm, the family lived in Keizer for 18 years. Mike currently works at Northwest Farm Credit Services as a senior forester/appraiser. He is a U.S. Navy veteran who served on the U.S.S. Merrill (DD-976). Cristina is the queen of the farm, in addition to serving as a part-time Spanish translator for the City of Salem. She enjoys beekeeping and is a member of Willamette Valley Beekeeper's Association. Jonathon is the owner/operator of Ice IT Support and a dedicated member of Oregon Emergency Communications. Julia is a master trumpet player and blueberry salesperson. She is a section leader in North Salem High School's marching band.